Review date: 10 December 2003. Thermalright have a well-deserved reputation for excellence in the exotic CPU cooler market, and it's based around a genuinely clever idea. Instead of the usual square slab of metal with fins sprouting out of it, Thermalright heat sinks have a base with a triangular-prism cross-section. The fins are bonded to the sides of the prism, the retaining clip runs through a slot cut in the middle, and the result is a heat sink with fins from top to bottom (for better air flow) and a shorter, wider thermal path from the CPU contact patch to those fins. The fins, of course, are copper, and thin, and numerous. 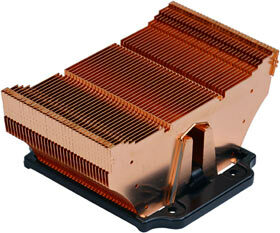 Thermalright have recently released an aluminium-finned hybrid, but everything else is all shiny copper. These two Thermalrights are for the few, the proud, the hard-core tweakers who don't mind a CPU cooler that can't be installed on a motherboard that's in a PC case. Instead of ordinary retaining clips, the SLK-800U (on the left) and the SLK-900U (on the right) use a through-the-motherboard bolt-on mounting system, which is sturdy and reliable, but which means you can't just pop the cooler on in ten seconds. On the other hand, the 800U/900U mounting system allows these heat sinks to be installed on both Socket A (Athlon, but not Athlon 64) and Socket 478 (Pentium 4) motherboards, provided there aren't any awkward components right next to the socket to get in the way. Because the Thermalright heat sinks flare out from a relatively small base, clearance problems should be pretty rare. Thermalright helpfully provide a list of motherboards that they've successfully tested with the SLK-800U here, and with the bulkier SLK-900U here. If a board's on the 900U list, I think it really ought to be fine with the 800U as well. I've reviewed the original SLK-800 already in my giant cooler comparison, here. The 800U doesn't have exactly the same heat sink, but it's very similar. The only big difference is the retaining mechanism. Like the SLK-800, the 800U can accept 60, 70 and 80mm fans. The bare heat sink, with no mounting hardware or fan attached, weighs about 555 grams. This is well over the maximum recommended weight for Socket A heat sinks, but through-motherboard mounting changes the rules; the heat sink isn't hanging from fragile hooks on the side of the processor socket, so it can be a lot weightier without threatening to cause untold havoc if the computer falls over or is bumpily transported. The SLK-900U is wider than the 800U, and can accommodate 70, 80 and 92mm fans. It weighs about 580 grams bare. There's not a lot of point buying a 900U if you're not going to use a 92mm fan on it. The extra fin-copper the 900U has is all far enough away from its 800U-identical core that it's not likely to add much to the heat sink's performance, no matter what fan you use with it. The 900U's 92mm fan compatibility, though, is a useful feature. Generally speaking, the bigger the fan, the more air it'll move per unit of power consumed and, importantly, per unit of noise created. 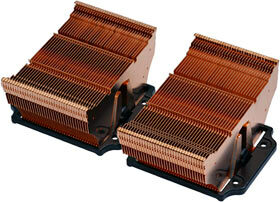 Lots of overclockers keep their computers quiet by using 80mm-fan heat sinks. A medium power 80mm case fan with about a two watt rating can shift quite enough air to keep a highly tweaked CPU happy, provided the heat sink's good and the case has decent ventilation. 92mm is another step up. A 92mm fan on the SLK-900U probably isn't, therefore, quite as well used as a smaller one would be. But if you want your PC tweaking colleagues to suffer from fan envy, this is unlikely to dissuade you. As you may have noticed, Thermalright don't use air-blocking fan frames around their heat sinks. Manufacturers that retain their fans with plain old boring screws have to do that, but Thermalright are more ingenious. They use wire clips, which insert into holes in the sides of the heat sinks; there are different clip-sets and hole-pairs to suit different sizes and heights of fan. The clips hold the fan down firmly onto the surprisingly sturdy tops of the edge-locked fins. And they look good, too. The SLK-800U has clip-holes that ought to let you install any slimline, 25mm or 38mm high fan. The SLK-900U only has two sets of clip-holes, and supports 25mm and 38mm high fans. I got the plain, no-fan versions of both of these heat sinks for review. In this form, the 800U lists for $US49.95 and the 900U for $US54.95 - though you may be able to find them cheaper, from one of the various dealers that stock them. 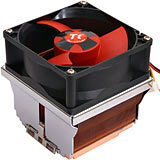 Thermalright also sell the SLK-900U with a fan included. The only fan they offer is a 92mm Delta FFB0912EHE (see it in the PDF data sheet here). As aficionados of PC accessories that can also be used as wood chippers will know from the "EHE" on the end of the name, this puppy's an outrageous, ear-bleedingly loud 110 cubic foot per minute behemoth, with a twelve watt power rating. You can quieten it down by running it from less than 12 volts, but if you're going to do that then you might as well use a milder fan in the first place. Anyway, the aptly named "SLK-900U Extreme", with its Steve-Buscemi-shredding fan, lists for $US69.95. To make the dual-fuel mounting system work, each of these heat sinks comes with an impressive heap of hardware. You don't get an instruction leaflet, but Thermalright don't expect you to be totally hard-core; they provide installation instructions on their Web site. Socket A installation's covered here. That instruction page is for the SLK-900U, but the 800U is functionally identical. Socket 478 installation instructions for the SLK-800U are here; instructions for the 900U are here. The procedure is, again, effectively the same for both heat sinks, but the 900U instructions are better illustrated. It's easy to line up the right sets of holes for each mobo type, because the hole spacing for Socket A and Socket 478 is so different. The original P4 Socket 423 had hole spacing quite close to that of Socket A, but Socket 423 and its unfortunate users fell into orphan-product purgatory some time ago. The basic retention arrangement is the same for both kinds of motherboard. A metal X-plate with a rubber pad in the middle goes under the board, and four mounting screws go through the board and into the plate. You slide springs over the screws to help hold the heat sink level whole you're installing it, but this is the kind of spring-screw mount where you're meant to tighten the screws down all the way, compressing the springs as far as they'll go. There's nothing wrong with this arrangement as long as you're careful, but if you tighten the screws like V8 head bolts you can and will destroy your processor, your motherboard and your self-esteem. 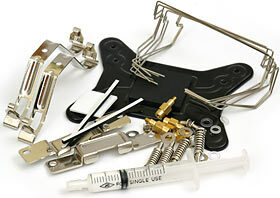 Spring-screw retention mechanisms that use conventional socket clips can be set up the other way around, so that tightening the screws loosens the clip - see Swiftech's classic coolers, for instance. This setup means it takes real talent to kill anything. Through-motherboard mounting systems, in contrast, can't help but allow you to cost yourself a lot of money with just a twist of the wrist. Deal with it. I expected the SLK-800U in its Socket A guise to perform much the same as the original SLK-800, and it did. Not exactly the same, though. The new retention mechanism can clamp down harder than the old clip did; I think that's why the 800U turned out to perform a shade better than the 800. When I put the same ludicrous Delta FFB0812EHE fan on the 800U that Thermalright bundled with the SLK-800, it howled its way to a very highly commendable 0.44°C/W result. This puts it solidly among the best air coolers I've tested, but you'd bleeding well want it to do well, with that much racket. Dropping to the same much-more-sensible 80mm 4.3 watt Sunon fan that'd turned in a 0.50°C/W result with the SLK-800 produced a pleasing 0.47°C/W. That's plenty good enough for pretty much anyone, and this fan's something you could actually live with day-to-day. Next, I re-jigged my CPU simulator into P4-contact-patch mode, to see how the SLK-800U performed with its Socket 478 hat on. P4s are easier to cool than Socket A processors, and they get to use bigger coolers, too; there's actually seldom much reason to upgrade from the stock cooler for a P4, if you've got a case with decent ventilation. And if you haven't, you should improve the case fans, not the CPU cooler. But anyway. With the FFB0812EHE, it didn't surprise me that the SLK-800U whipped past every P4 cooler I'd previously tested, to score 0.37°C/W. That's pretty much in water-cooler territory, but I remind you that 12 watt Delta fans are not really viable CPU cooling options for anybody who can hear. And deaf people whose pets can hear shouldn't use 12 watt Deltas, either. With the more sensible Sunon, the SLK-800U managed 0.40°C/W. Another great score, and without an ungodly noise. I didn't have a FFB0912EHE to hand to use with on the SLK-900U, but I think we all know what it'd do. Spectacular results, awful bloody noise. Let's move on. With a disturbingly sensible Sunon 92mm fan with a mere 2.9 watt rating, the SLK-900U in Socket A mode achieved... 0.47°C/W, the same as the SLK-800U with its smaller, louder Sunon. This is a very impressive score for the noise level; in most cases, this fan inside the case will be less audible than the PSU exhaust fan. In P4 mode, the SLK-900U scored 0.39°C/W with the 2.9W Sunon. And didn't break a sweat. The geekiest air coolers around today aren't solid metal units like these; they're heat pipe designs, like the one I checked out here. 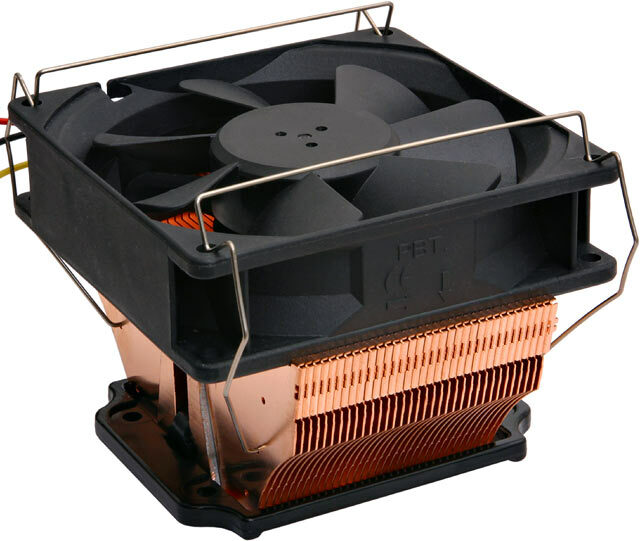 Many heat pipe coolers are quite tall, though, which can cause clearance problems and is particularly risky to your CPU socket's health if they mount with a normal clip. And, in theory at least, heat pipe coolers can become nearly useless if they spring a leak, though I don't think such a mishap is at all likely if you don't subject the heat pipe to considerable physical abuse. Thermalright haven't failed to notice the heat pipe revolution. Their new SP94 has the exhaust manifold to prove it, and I hope to check one out in the near future. In the meantime, though, the SLK-800U and SLK-900U continue Thermalright's reputation for producing top-class copper coolers. Earlier this very day I checked out Thermaltake's Extreme Volcano 12, another thin-fin copper cooler that comes standard with a powerful fan and some extra frills. At full power, the Extreme Volcano 12 isn't nearly as obnoxiously loud as Thermalright's "Extreme" packages, and it performs just as well. And it sells for less. The Volcano 12's bigger and uglier than the Thermalright options, though. And, more practically, its elephantine bulk is retained by a plain old three-hole hook clip. If you're moving your computer around regularly, you'll be safer with an 800U or 900U than with a Volcano 12. Accordingly, the SLK-800U and SLK-900U score a Recommended from me. Thermaltake's Extreme Volcano 12 ain't subtle, but it's good.